A steep rise in gold prices may have given hope to a battered mining industry in 2016, but after four tough years producers in Africa are still too wary to call the bad times over. Gold prices surged 15% in the first three months of 2016, the biggest quarterly rise in nearly 30 years, boosting miners’ share prices, attracting new investment and promising to bolster the economies of gold-rich countries. Experts say the rebound could spur development of major unexploited deposits after low prices since 2012 crippled exploration and made countless projects unprofitable. Still, Africa-focused gold producers are not quite ready to make investment decisions because of a brief price rise. Prices have often spiked in recent years only to quickly retreat – indeed, the recent rally has stalled in the last few weeks after the very strong start to the year. Prices aside, some industry experts say a recent spate of takeover bids could be another indication of a sector recovery. Amara Mining, which has projects in Ivory Coast and Sierra Leone, was subject in February to an $85-million bid by Australia’s Perseus Mining. Canada’s Endeavour Mining, which owns gold mines in Ivory Coast, Mali and Ghana, is in the process of taking over TrueGold, another West Africa-focused miner. Gold prices dropped from over $1 900 an ounce in 2011 to near $1 000 at the end of last year. Mines that were profitable at $1 500 suddenly became loss-makers. Exploration halted; share prices dived. Gold production has remained robust, mainly due to production from existing mines. Without major new exploration, however, output could drop in the years to come. Prices are now over $1,200 per ounce, helped by low interest rates. The cost of producing gold, which came down during the slump, remains low for now, which could aid exploration efforts. Endeavour Mining has seen its production costs fall from $1 137 an ounce to around $900. At its Agbaou mine in Ivory Coast, it produces gold at about $700 an ounce. “There is optimistic caution,” Endeavour Chief Executive Neil Woodyer said. “It is a time for getting ready rather than any huge commitments.” Endeavour, whose share price rose nearly 50% in the first three months of the year, expects to spend $14-million this year in “non-sustaining exploration”, or exploration involving new finds, up from $8 million last year. It hopes to soon begin construction of the Hounde mine in Burkina Faso that over ten years will produce about 1.9-million ounces of gold. Investors are taking notice. “Over the last two years they have been in defensive mode and cutting costs, now they are starting to generate cash,” said Andrew Breichmanas, analyst at BMO Capital Markets in London. Erich Meier, who runs a suite of gold funds at Konwave AG in Switzerland, said his funds have yielded over 60% this year, a rebound from a drop of 27% last year. 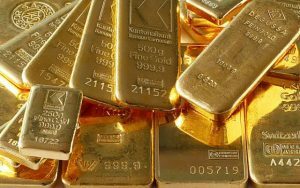 “There are further risks remaining for an attack on gold prices.” Meier said. “But we are entering into a three-to-five year bull market.” Randgold Resources, a firm with mines across Africa, stood out from peers by continuing to explore through the downturn.